I’m participating in The Kitchen Cure. I’ll track my progress here, and in this flickr set of before and after photos. The final assignment was to begin planning a dinner party. I didn’t start on the Day 10 assignment on Friday, but I’m not really including this in the remaining things to do. I have been thinking of having a small party, but I may wait until a bit farther into the fall or early winter. Things are still pretty busy on weekends right now. What I did do this weekend was pick up a couple of small things from the organizing and tools list. I added a rack in the cabinet with plates to make them easier to get to, a little sponge holder thing so the sink area is neater, and my Ove Gloves arrived so I tossed the old oven mitts. Here’s a look at the sink area. I put away the gloves and bottle scrubber, since they just clutter things up. 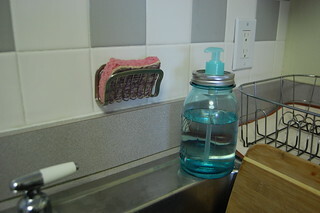 What I’m most pleased with is the use of a truly vintage Ball canning jar as a dish soap dispenser. I got the jar a few weeks ago at a neighborhood yard sale, and wanted to put it to some use other than canning with it. I poked a hole through a used lid, threaded an old lotion bottle pump through, and held it all together with a canning ring that’s rusting on the inside but looks fine on the outside. The pump needs to be secured on the inside with some glue, but I haven’t dug out my glue yet to see what will work.